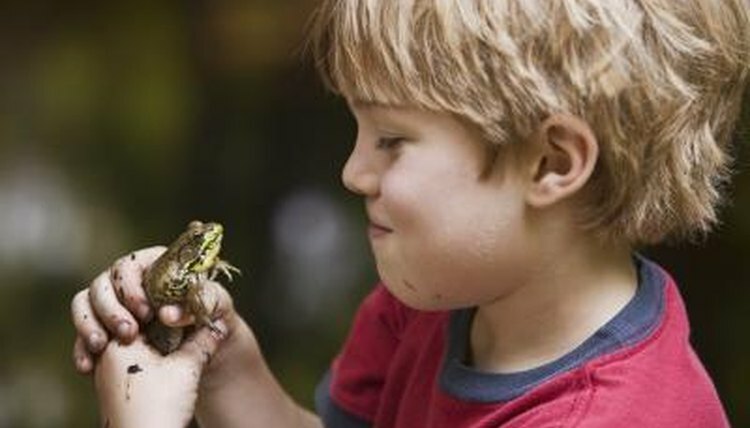 Frog croaks and calls help to create the natural soundtrack of a forest, swamp or pond. While the males’ mating calls are the most commonly heard and best recognized sounds, frogs and toads of both sexes make a variety of vocalizations. The exact mechanism by which frogs produce their vocalizations is not fully understood, but it involves the animals forcing air over their vocal cords. Males of most anuran species have a distensible vocal sac that is inflated and deflated during mating calls. Though some scientists have contended that the vocal sac functioned as a resonator, A. Stanley Rand and Robert Dudley were able to demonstrate this is not the case in a 1993 study published in “Zoological Physiology.” During their experiment, Rand and Dudley administered helium to the frogs; if the frequency characteristics of the frogs’ calls changed from the helium, then it meant the vocal sac served, at least partially, as a resonating chamber. The three species tested in the study did not demonstrate a change in their call, so while there is still much that scientists must learn about frog calls, it is clear that the vocal sacs are not resonators. Males attract females with their mating calls. Females select males, in part, because of the character of their calls; intensity, frequency and cadence are variably important factors for different species. While there are variations on the theme, most male frogs travel to a mating site and begin vocalizing. When a female becomes interested in a male, she will allow him to approach her. The male will clasp on to her back in a behavior termed amplexus, during which he will fertilize the eggs as she expels them. Within the past few decades, scientists have documented female frogs emitting vocalizations for breeding purposes. Often, female vocalizations are very quiet, and to human observers, inaudible amongst the male chorus. Sharon B. Emerson and Sunny K. Boyd demonstrated that not only do the females of some species emit vocalizations, but that these vocalizations varied from those of the males. In their 1999 paper published in “Brain, Behavior and Evolution,” Emerson and Boyd observed that the female calls were most similar to the release calls of males, rather than the mating calls of males. Some frog species defend a spatial territory and emit vocalizations advertising their presence. This behavior is best documented in males, but is documented in females of some species, like bullfrogs (Rana catesbeiana). An interesting and important vocalization that many frog species make is a release call. Mating is often a chaotic affair for frogs. Males are apt to attempt amplexus with any suitably sized object in their vicinity; some particularly aggressive breeders will even grasp frogs of different species. To combat this, many frogs have evolved a release call; when a frog is grasped by another frog, she emits a sudden sound, and the aggressor releases his grip. When a female is receptive to mating, she will suppress the release call, and allow amplexus and fertilization. Some frog species exhibit distress or alarm calls. These occur when a frog is grasped by a predator and may serve to startle the predator or attract secondary predators -- secondary predators which may allow the frog a chance to escape. Additionally, some frogs will emit an alarm call as they jump in the water to escape a predator, which may alert other frogs to a potential threat.